Neuromodulation therapeutics—as repeated Transcranial Magnetic Stimulation (rTMS) and neurofeedback—are valuable tools for psychiatry. Nevertheless, they currently face some limitations: rTMS has confounding effects on neural activation patterns, and neurofeedback fails to change neural dynamics in some cases. 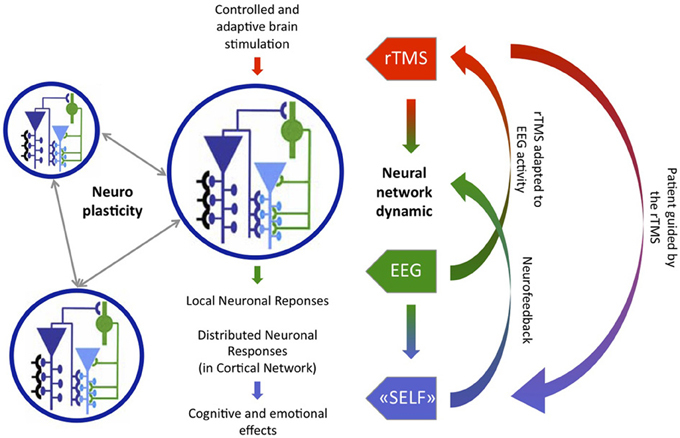 Here we propose how coupling rTMS and neurofeedback can tackle both issues by adapting neural activations during rTMS and actively guiding individuals during neurofeedback. An algorithmic challenge then consists in designing the proper recording, processing, feedback, and control of unwanted effects. But this new neuromodulation technique also poses an ethical challenge: ensuring treatment occurs within a biopsychosocial model of medicine, while considering both the interaction between the patients and the psychiatrist, and the maintenance of individuals’ autonomy. Our solution is the concept of Cyborg psychiatry, which embodies the technique and includes a self-engaged interaction between patients and the neuromodulation device.